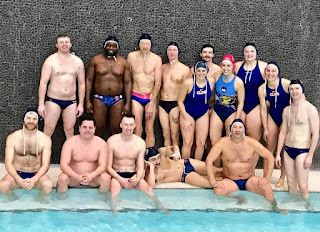 Years Playing Water Polo: Over 3 Great and fun years meeting wonderful people. That are more like a family to me. Favorite Team Memory: I have many. The first one is meeting all of you for the first time. I have very fond memories of all of you. Also the sad moments when we lose our members. When they move away for one reason or another. I do hope you all move back. We miss you all. Especially Shami, Kyle and Charlie. But the best moments are when I help find you a new home. I helped so many here in finding a home. Vince, both Aarons, Kasi and Landon. Now X is a Mortgagor. X helping me makes it more fun. Favorite Tournament #1: I guess if I have to pick a moment it is going to the 616 tournament 2yrs ago. Playing Beer pong with everyone. Then the drunken escapades after that. OOO the next morning. OOO the hangovers!! Favorite post practice snack? MMMM BEER and more Beer at Merry Arts. Right Trish and Kyle?! Along with Extra Crispy Fries - with A1. ..Or if I remember to bring my bottle Heinz 57. Maggie and Grant are loving it too - At times . We love to go for that fine courtesy service on taco Thursday. Right Mody?! Favorite Tournament #2: Then the second is Toronto. All the fun times in the bars. With Grant's and Adam's dancing shenanigans. Now that was memorable. Also driving to Toronto with Vince, telling me how happy he will be as a daddy. Vince you are a good dad. Don’t forget to send us baby pictures. Ron's teammates describe him as, "The sunrise of our lives, full of wonderful wine, love for all he meets and the best crock pot meatballs in town." Give us some advice about life: Share when you can. Help when you can. Treat everyone polite as a first impression. Drink wine everyday. If wine is not readily available drink Beer. My house is your house. Try and learn something everyday. Go church shopping. If not to seek God, then inner peace. By helping a church or elderly person even a animal shelter . By the way, thanks to everyone for helping raising almost $300 dollars. For the Animal shelter on Brook park Rd in Parma. Along with all the donations. At the White Elephant Christmas party we had. Favorite Tournament #3: I guess the third one that nearly killed me . It was my Idea to walk from the Air B&B. After caring on a conversation with Mody and the local drunk on a street corner in Cincinnati. Mody and I walked up 2 thousand steps or more to get to the pool at University of Cincinnati. The Local drunk told us there where a lot of steps. For some reason I did not believe him. Well there was. Finding Mody and X, with help from a adult beverage. The two of them trying to fined a pizza joint. Then seeing Mody and X running down the street with a pizza box. The size of a Honda civic car hod and a adult beverage. Now that is a site. What is Eric's Favorite part about Water Polo? Well Eric is not really a huge fan of Water Polo. :) What he does love is hearing all the stories I tell him. What someone said that was funny. Or if he did not go to a tournament the stories I bring home. What is Eric’s favorite part about the team: “That everyone is so open and friendly. Also, everyone is very excepting of Eric and I. Eric loves Kasi's Ugly Sweater party. Eric loves when you all come and visit us at the lake. Can't forget hanging out on the Pontoon with you all. As Mody lovingly calls it the Poontoon. When will the next batch of Ron wine be ready? Well it is ready for you all now. Lets go in the wine cellar together and crack a new one open. Wine tasting is at hand. I will be making new wine in April. If anyone wants some for their very own. What is more difficult? Being President of Cinnamon Lake or Water Polo? That is easy. Water polo is much easier !! When I ran for the Board here at the lake. My slogan was and still is ( Together we can make a difference. ) To encouraging a team like atmosphere at the lake. 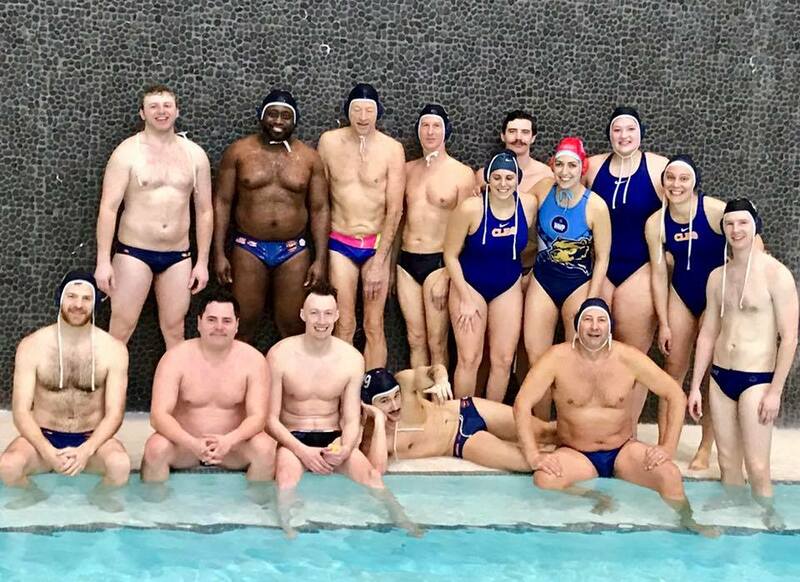 The Cleveland Water Polo club has that team atmosphere. I know that I am far from being the best player. But you never hear negativity directed to anyone. Only encouragement on how to improve, from this team. I love hearing advice on where to throw the ball or where to swim as I am playing. I do listen to you all. Shami was great at that. Thanks for all your help. Thanks for letting me be part of your team. You all are not only great team mates and family. Welcome to my home there is wine in the fridge for you. Lastly, I would like to say: Thank you to all the persons that are on the Cleveland Water Polo Board of directors. Especially for Kasi. For being a great leader and coach. For Trish and Kyle doing all the leg work- booking hotels and making reservations. We do notice it and appreciate it. To Grant and Adam for their leadership in the pool. Everyone else in a leadership rolls. Thank you!! I know it is not easy being on the board. We do appreciate it. -Together we can make a difference, Love Ron !! Thank you, Ron for all your love, support, laughs and hard work in the pool. We all recognize how far you have come in this sport. You are one of the greatest Most Improved Success stories of our team. We love you! Loved reading this. Congrats Ron!